While popping a pimple is no fun, you will enjoy this video by Dr. Ava Shamban, M. D. Don’t let the message get lost in the histrionics because the doctor talks about how to safely pop a pimple without causing a scar. It could spread the infection and cause more pimples. This can happen if you press deep into the skin while draining the pimple. That sort of pushes the bacteria and oil down into the skin and spreads infection, causing more pimples. Spread of infection to nearby skin is one reason why you see pimples clustered in a single spot. It is also why pimples keep coming up at the same spot. One pimple heals and a new one comes up right at the same spot, ever had that happen to you? It could cause permanent scarring – pits in the skin. Again, pressing too hard can cause tissue damage around the pimple and pits in the skin. It is important to know that you can get a scar from a pimple even if you don’t pop it. It is a huge myth that only pimples that are popped cause scarring. Depending on the type of pimple and tendency of your skin to scar, you may get a scar even without popping it. What kind of pimples can you pop safely? The kind that are not inflammatory. Simply put, the kind of pimples that are not red or swollen around the tip and are not cysts (deep into the skin). Whiteheads are non-inflammatory acne. Apply gentle heat to the pimple by placing a warm cloth on it. Warm, not hot. 🙂 You could warm up an old cotton T-shirt on a heated pan (the kind used to make chapatis works) or in a microwave. In my experience, using a moist warm cloth works better than a dry cloth. The steam from the moist warm cloth does a good job of loosening up and softening the pimple. So wet the cloth before heating it. 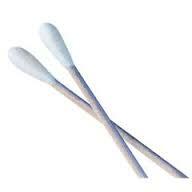 Use 2 cotton buds (Q-tips is a brand name) to gently squeeze the white stuff out of the pimple. Be careful not to press the buds into the skin, but to do a lifting-up motion so that the white stuff comes out instead of getting pressed deep into the skin. Also use the lightest pressure. The third step is where it gets tricky. The video recommends using hydrogen peroxide or salicylic acid or toothpaste onto the popped pimple. All of these are great options but only if you get pleasure out of torturing yourself! This is because when you pop a pimple, the area becomes sensitive and if you are going to nuke it with skin irritants like the ones mentioned above, you will increase the redness and burning. For post-popping pimple care, see my post 6 steps after a pimple has popped and heal it fast. If a pimple isn’t responding to gentle cotton bud pressure or if it starts to pain more, then leave it alone for a day or two. Keep using an exfoliating treatment on it containing glycolic acid or salicylic acid so as to thin out the skin on the top further until it is ready for popping (only if need be). If it is a cyst, then do not attempt to pop it. Cysts need stronger treatment such as retinoids and sometimes antibiotics.